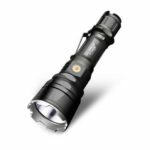 This LED Flashlight is a practical and durable flashlight. 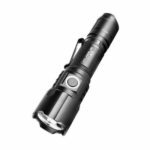 Equipped with a high-performance LED offering a maximum output of 3200lumens. Made of Aerospace Aluminum Alloy 6061-T6, Mil-Spec HAIII Anodizing, durable and solid. 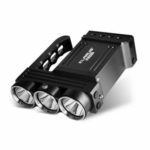 It is specifically designed for outdoor, diving, adventure or hunting. 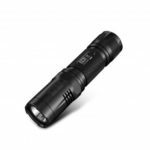 Compact and lightweight, the flashlight is easy to carry. One Touch Strobe, One Touch Turbo, One Touch Low, Mode Memory Function, SOS, Switch Lock-out Function, Quick Settings Switch. Intelligent Thermal Protection System (ITS), Intelligent Battery Identification System (IBIS), Intelligent Charging System (ICS). Tactical Setting; Outdoor Setting. Tactical Setting: Specially designed for self-defense and tactical use. Classic KLARUS XT series control interface. One Touch Strobe; One Touch Turbo; perfect candidate for any mission. Designed with the wilderness in mind. 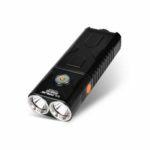 One Touch Low; One Touch Turbo; Multiple output levels with memory, SOS function; suitable for all needs in Hunting, Hiking, Camping or Search and Rescue. Monitors and auto-adjusts output levels in real-time, keeps LED and crucial component safe for the best balance of performance and safety. 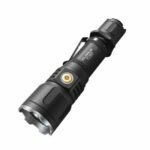 Adjusts output according to the currently installed 18650 battery discharge rate, compatible with 18650 Li-ion batteries, CR123A batteries and Klarus 16340 batteries. Micro-USB charging port with real-time monitoring of charging status to prevent overcharging, limits max charging current to 1A ( avoiding damage to charging devices), safer and faster charging. Over-Charging Protection, Over-Discharging Protection, High Current Protection, High Temperature Protection, Reverse Polarity Protection, making the XT11X safe and reliable. Protection eliminates damage from incorrect battery orientation. Aero-space Aluminum alloy body with CNC machining; Mil-spec hard anodizing (HA III); lightweight yet robust construction. Stainless bezel ring offers protection for crucial components. Material Aerospace Aluminum Alloy 6061-T6, Mil-Spec HAIII Anodizing. Charging Time Depends on the battery capacity. Compatible Batteries 1 x 18650(Included) or 2 x CR123A(Not Included) or 2 x Klarus 1634(Not Included). Lens Hardened Mineral Glass; AR coated; Scratch resistant. Switch Tactical Tailcap Dual-Switch + Side Switch.